Another gorgeous sunny day here in Gib....Roy has been out on his canoe....while i have been doing "My Anything but a card" for our Christmas Card Club....just a bunch of us girls making a card every two weeks... if you would like to join in all the names are on my sidebar ......It was Clares turn to Choose what to do !!!!! i was not a happy bunny!!!!!..... I started my project last night finished it at midday today ...making it... as i was watching "The Voice" on the I Player i cried at everyone that sang.... what talented Singers they all are.....I nearly through this box in the bin....i am not that pleased with it !!!! 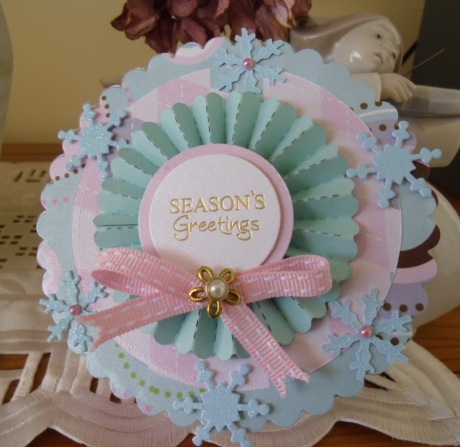 Its very pretty Sylvie, love the soft colours and the rosette on the front! The voice was great last night but so hard to pick which one to go each pair! What a sweet little box. Wowzer Sylvie how could you not be pleased with it, it is absolutely beautiful, this is something that I would struggle to make, the colours, embellishments and the style is top notch. I have to agree with everyone elses comments as this really is such a beautiful box and what a lucky person who receives this! 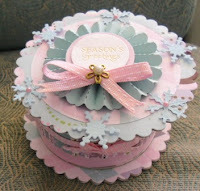 Well I think it is so pretty and I have not even attempted to make a box!!! Goodness knows why you would even think of throwing your pretty little box in the bin, Sylvie...it's gorgeous! This is so pretty Sylvie well done , what a lovely present box. A wonderful project... please do not throw away!! Beautiful soft colours and so much work!! You can't throw it into the bin!! 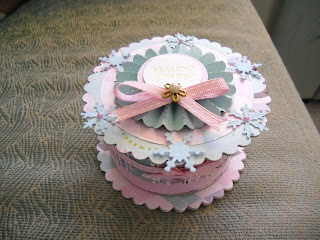 Hi Sylvie, what a fab box, beautiful colours and lovely detail. This is a wonderful keepsake. Done mine at last and going to post after I leave my comments. Take care. Sylvie...what's happening with your blog? I hope you're not still having problems. You have just shown up twice on my blogger list, but there was nothing showing on the first one and I couldn't leave a comment to let you know. What a magnificent little happy Christmas box -so pleased you didn't throw it out! Such a delicate & femine design & colours - it is truly lovely Sylvie! This is just gorgeous Sylvie....love the soft colours. Hope you haven't thrown it away! Sorry for the lackof visits and comments ...... Better late thank nev I guess.